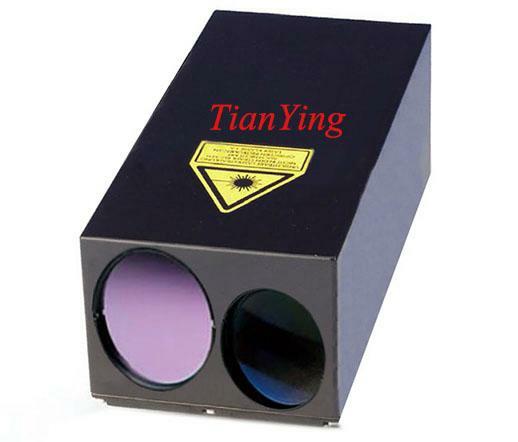 China TianYing TY-LR77 12km-20km compact laser rangefinder module 1 Hz continuous 30minutes, developed for observation platforms tasked to acquire small, moving targets, hence the 1 Hz continuous measuring rate and the extended range. They can find the range to large targets such as wayship to distances up to and even beyond 20km. The LRF-20km 1 Hz is installed in platforms on ships, land vehicles or aero planes. Easy integrated to camera system, fire-control system etc, it is ideal for 275mm to 460mm focus cooled thermal camera system. 1) Beyond 10km ranging capability of 30% reflection 5m² airplanes, beyond 15km ranging capability of 40% albedo 25m² target, up to 20km ranging capability of mountain/building/large craft. 2) 1Hz continuous measuring 30 minutes. 3) Beam divergence 1mrad, option 2mrad, 0.8mrad, 0.7mrad, 0.6mrad, 0.5mrad, 0.4mrad, 0.3mrad etc. 5) Only 620 cubic centimeters in size. 6) Less than 600g weight without house. 8) Reliability: life > one hundred thousand range measurements and MTBF > 4000 hours. 9) Easy integration to compact observation systems and compact fire-control system for airborne, maritime and land-based optronic.